This connection to Hotelbeds will also update GTA and Tourico Travel. Beds24.com can export rates. We send ONE ROOM price. If you have multiple rates by default the lowest price will be sent. Rates - Only the ROOM price is sent. Prices for "Extra Person", "Extra child" and discounts set in the "Discounts" tab of the rates can not be sent. Existing bookings are not automatically imported when the connection is established and should be entered into Beds24 manually. "Upsell Items" can not be exported. If you want to access credit card details through Beds24 ask Hotelbeds to only accept bookings with credit card details and always send all details to Beds24. If you sell rooms individually at another channel or your own web site and want to sell them here as a "roomtype" with a quantity of more than one you can set up virtual roooms. 2. The email address where the reservations will be sent in case Beds24 cannot process them. Hotelbeds will notify you when the BMS connection is ready. Enter your Hotelbeds username into the field "Username"
Enter your Hotelbeds password in the field "Password". Click on the "Get Contract List" link to access your contract list. Enter your Hotelbeds Hotel Code into the field "Hotel Code"
Enter your Hotelbeds Contract Name in the field "Contract Name". 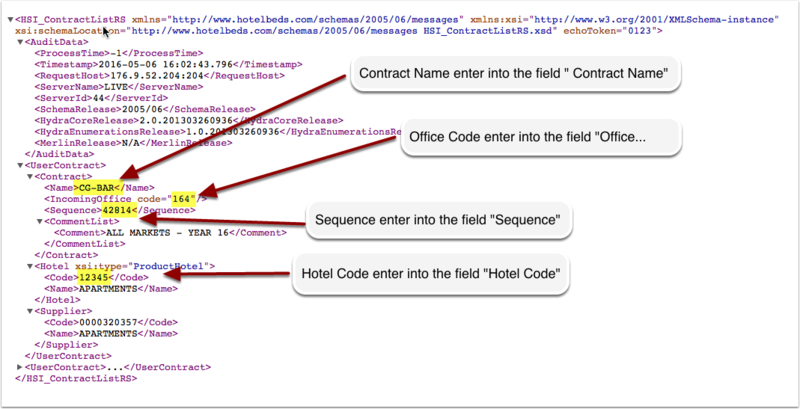 Enter your Hotelbeds Sequence into the field "Sequence"
Enter your Hotelbeds Office Code into the field "Incoming Office Code"
Click on the "Get Contract Detail" link to access your contract list. 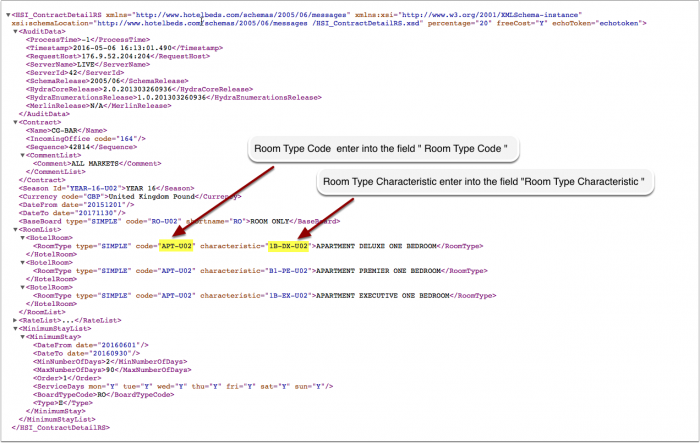 Enter your Hotelbeds Room Code into the field "Room Code"
Enter your Hotelbeds Room Characteristic into the field "Room Characteristic"
Tip Click on the "View Actual Data" Button to check which prices and availability will send. 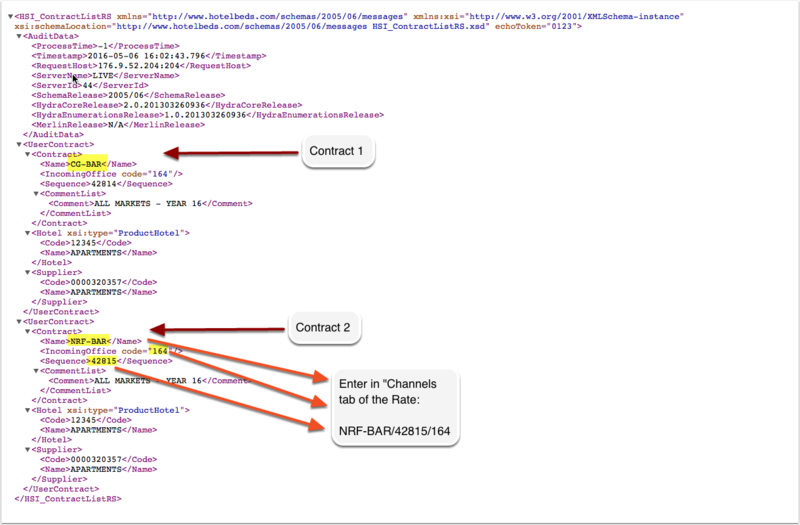 Specify the first contract in the channel manager settings. Make sure "Hotelbeds" is ticked in the "Channels" tab of all rates you want to send to this contract. Multiple contracts require rates to be defined for each contract. Open the rates or daily prices you want to send to the second contract. In rates go to the "Channels" tab. Tick "Hotelbeds" and enter the contract name and sequence for this contract separated by the / symbol. 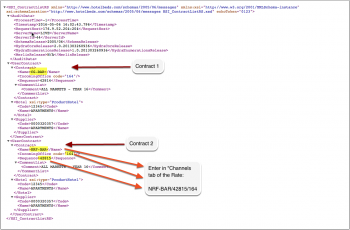 If the office code for the contract is different to that set in the channel manager settings, it can be specified as a third item in the rate setting. Daily prices and rates in which you have not specified a contract will send only to the first contract. You can view the live availability and prices that will be sent to Hotelbeds before or after activating using the "View actual data" button. When everything is correct tick "Inventory", "Prices" and "Bookings" to activate the connection. If you want to add a multiplier to your prices, for example because Hotelbds requires a different currency to your Beds24 currency, add a * followed by the multiplier number to your Contract Name. To convert the price of bookings imported add a * after the multiplier, for example 12345678*1.23* will divide the price of the booking by 1.23. The connection is working if you are not receiving error messages and the display in the channel is correct. If you are receiving error messages check in the "Common Errors" section why you are receiving the error and how to fix it. Changes to availability and prices will be instantly sent to the channel. Changes for settings for example minimum stays, or quantity of rooms will send with the next update. Click on "Update" if you want to push them through instantly. Check if your username password and hotel code are entered correctly. . If yes send and email to [email protected] and ask them to check the connection with Beds24 is activated. This change is not permitted as it does not agree with the signed contract. You have a contracted allotment or restriction (for example on the minimum stay you are allowed to send) in Hotelbeds. Click on the "Get Contract Detail" link to check if/which minimum stay restriction (MLOS=X) applies. Make sure the data you send from Beds24 complies with your contract with Hotelbeds. If you want to sync only inventory and have multiple contracts you need a rate for each contract with a price. In the "Channels" tab of the rate deselect "Hotelbeds" and if will not send.